The U.S. Navy awarded G Systems a contract for automated test equipment (ATE) for the MK 41 Vertical Launching System (VLS). G Systems is a leading provider of solutions for automated test and measurement, data acquisition, and control systems. G Systems, a leading provider of solutions for automated test and measurement, data acquisition, and control systems, has been awarded a contract valued at over $6.7 million by the Naval Surface Warfare Center, Port Hueneme, California to integrate and build automated test equipment for the U.S. Navy’s MK 41 Vertical Launching System (VLS). The MK 41 VLS is a modular, below deck missile launching system that was originally designed for the Navy’s Aegis-equipped guided missile cruisers to provide air threat protection for naval battle groups. 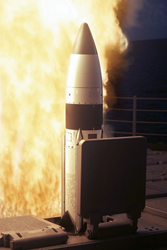 The MK 41 VLS is a multi-missile, multi-mission launcher, capable of launching SM-2, SM-3, SM-6, ESSM, Tomahawk, and Vertical Launch ASROC missiles. G Systems’ contract includes three (3) specialized test units, the Control Module Automatic Verification Equipment (CAVE), the Module Automated Test Equipment (ATE), and the Launch Sequencer Automated Test Equipment (LSEQ). These test stations simulate the signals and switching normally provided by the ship’s other launcher Line Replaceable Units (LRU’s); the Motor Control Panel (MCP) and Programmable Power Supplies (PPS’s). In total, 24 individual test systems (including all contract options) will be delivered with test cable assemblies. G Systems will assemble and integrate the automated test systems at their Richardson, TX facility outside of Dallas, TX. “This contract is actually the second of two major VLS test system orders. We are pleased the U.S. Navy recognized G Systems’ experience and capabilities to deliver large scale automated test equipment orders” said Lynda Harrell, G Systems’ Founder and CEO. Headquartered in Richardson, Texas, G Systems, L.P. (G Systems) is a leading integrator of test and measurement automation solutions for the aerospace/defense, energy, life sciences, semiconductor, and telecom industries. With over 25 years experience refining a proven design methodology and integration process, G Systems is known for consistently delivering high-quality low-risk solutions that improve process quality and efficiency from design and prototype development through final production. G Systems offers services ranging from expert consulting to single or multi-unit turnkey deployment. Capabilities include software, electrical and mechanical design and build, data management, and system builds as well as build-to-print systems.